Playing The Code Interview Game, Part I: The Plan for a Plan! In this quick article, we give some advice on how to prepare for your next interview and help you land a great development gig. I was talking yesterday to a friend of mine and he is looking for a new job. I stressed to him that looking for a new job in the tech industry should be treated as a serious business. It involves making a plan, reviewing computer science academy basic algorithms, fine-tuning your resume, and practicing logical questions and programming questions. Now, although this is a serious game, we at developers at rest, think that developers should rest, therefore an inherent part of our plan is not to work your brain too much and to also take time to relax. In this step, we are going to cover how to go about planning your interview study guide. List computer science algorithms and data structures topics to study. Aggregate the topics in a Google spreadsheet. Make a schedule to study them, going over theory first. List timeline to practice each and every one of them. Find a list of books from which to get problem sets. List websites to practice programming tasks. List companies to do dry-run interviews on (companies you are less interested in). List companies you are interested in and after you finished the dry-runs, go to these interviews. If you have other topics you would like to mention please do comment on this topic below in comments section. 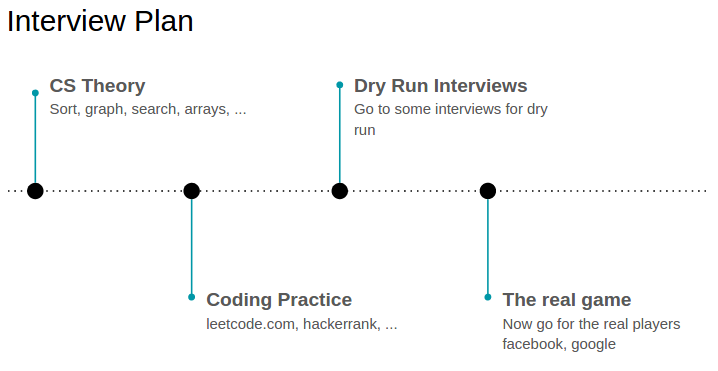 With that, we'll conclude our advice on planning for programming interviews. In the next post, we are going to go through step number 1 which is to list computer science algorithms and data structures topics to study. Follow us there and leave a comment if you have any question or issue! Published at DZone with permission of Thomas David . See the original article here.